This course is the Level 2 Paediatric First Aid for Nannies and Au Pairs. The Ofsted requirements for Nannies and Au Pairs depend on whether registration is required . If you choose to register, in most cases people working with children including Nannies, Au Pairs, Childminders, Nursery Workers and Childcare Workers still need the FULL 2 DAY PAEDIATRIC COURSE or the 1 DAY BLENDED COURSE to meet the requirements. If you are looking at also entering other childcare sectors, then the full 2 day or our blended paediatric course would be best. Regulations for the Childcare Register require the childminder or home child carer to have an appropriate first aid qualification. However, it is for the provider to determine whether these minimum standards are appropriate for the type of care they provide and whether more advanced training or qualification is required. This one day or online/blended course is for Nannies and Au Pairs who do not need to register. 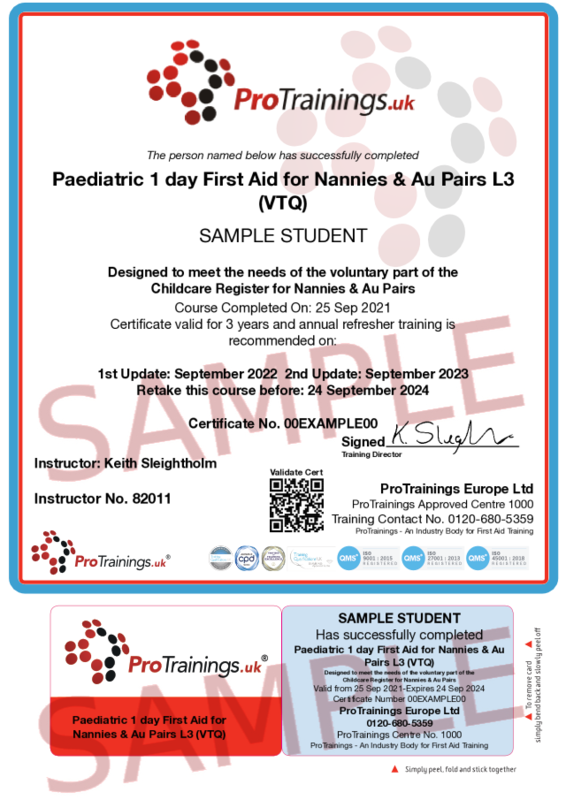 This 6 contact hours course can be taken as a classroom course or blended using ProNanny.co.uk and is also ideal as an annual refresher for any paediatric first aid course.